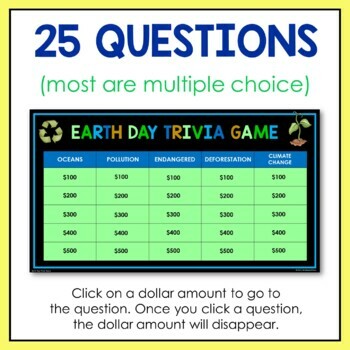 This editable, no-prep Earth Day Trivia Game includes 25 questions in 5 categories. 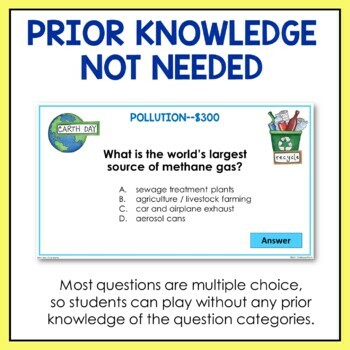 All the answer slides include additional information about the question AND full-color photos. 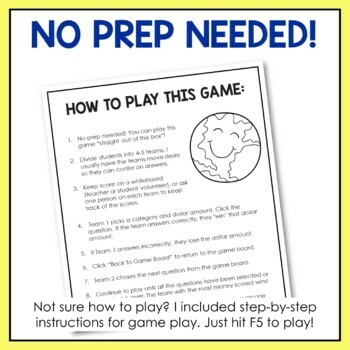 A great complement for conservation lessons or just for Earth Day fun! Once a dollar amount is selected, it disappears from the game board. Restart the game to reset the game board. 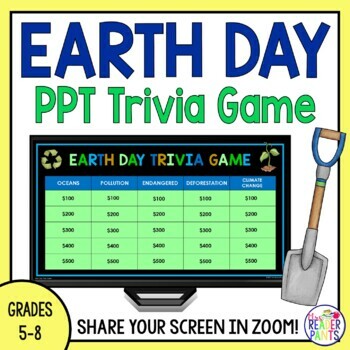 This game includes questions about all of these Earth Day and conservation-related terms and concepts: agriculture, Amazon Rainforest, biodegrade, carbon dioxide, climate change, conservation, decibels, deforestation, endangered, extinct, global temperature, global warming, Great Barrier Reef, greenhouse gases, methane, ozone layer, poaching, pollution (water, air, noise, light, natural), rainforest, recycle, Pacific Garbage Patch, pet trade, and urbanization. Animals mentioned in the game include: African lion, bats, Chinese river dolphin, lemurs, manatees, orcas, orangutans, sharks, and white-tailed deer. I regularly add new products for school librarians and English teachers, particularly at the middle school level, to my store. I'm also excited to announce that starting in January 2019, all new products will be half-off for the first 48 hours! Look for the green "Follow" link under my store name. Following my store will give you notifications of when new products are posted. I also post all my new products to my MrsReaderPants FaceBook page.